The first time I ran the program it detected my AMD cards just fine, however it froze at some point during benchmarking, and after that wouldn’t detect the AMD cards. It did this on three different machines. I just dropped the KBomba-Mod MinerControl program into their sgminer directory and kept on running that way. It would be nice to get it working though. The built-in benchmarking feature is really nice. Yeah, same problem with their Miner as well. It is a bummer considering the benchmarking is the only way it will switch Algos Automatically. Thought they would have actually gotten this working already before saying it is working, or maybe the release got messed up with something by accident. 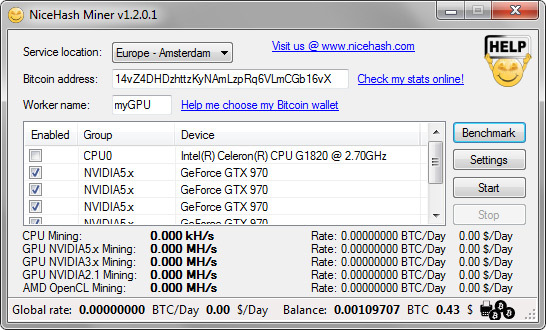 Same results on HD7970.. wil not even recognize the card.. Can mine just fine with sgminer tho.. Not sure this was ready for public release! Where is the auto x15 algo on the GUI? I have AMD HD 2900 1gb duel GPU nothing and also HD4800 2gb nohting really i would think it would pick up nothing so upset!! !